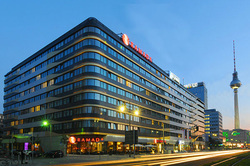 With its 1012 rooms & suites on 37 floors and a total height of 150m, the Radisson Park Inn Alexanderplatz is the second largest hotel in Germany and the tallest hotel in Berlin. 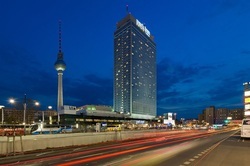 A hotel of superlatives and next to the Berlin TV Tower acentral landmark at Berlin’s Alexanderplatz Square with breathtaking views of the bustling German capital. Choose this hotel for a fantastic stay in Berlin in a central location with many amenities and facilities such as the Precious Spa & Fitness, the original Old-Berlin style Zille Stube Restaurant, Humboldt’s Restaurant serving Berlin’s most popular Sunday Brunch, Spagos Restaurant, Bar & Lounge offering Euro-Californian cuisine and live music, rooftop terrace and the world’s fastest passenger cable wind, Europe’s unique Jochen Schweizer Base Flying. Just a 2-minute walk from Alexanderplatz, this hotel offers a rich breakfast buffet and modern, soundproofed rooms with a flat-screen TV. It has great transport links to all parts of Berlin. The hotel has air-conditioned rooms featuring a stylish design. Some include a separate living room and electric kettle. International food is served in the hotels interational restaurant. There is a bar and smoker’s lounge, as well as business facilities. Guests can relax in the gym or sauna after a busy day. Free WiFi. Mollstraße/Prenzlauer Allee Tram Stop is a 2-minute walk away. Alexanderplatz offers train, underground and bus links to Berlin’s major attractions and airports. Located on the Kurfürstendamm shopping strip, the hotel is within a half-kilometer of the Tiergarten and a U-bahn station, providing links to the rest of Berlin. Opulent indoor pool decorated in the luxurious Roman Empire style, the indoor pool and fitness area has steam rooms, massage service and on-site shops include internationally known designer names. 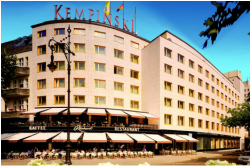 Kempinski Hotel Bristol Berlin's 246 elegant guestrooms and 55 suites feature views of the busy shopping strip or an inner courtyard; all have minibars.